I review 2 marathons that I ran this year as a part of training for racing! I had run a couple of 1:37 half marathons during training this season and was hoping to dip under that, given my performance in the fuller version of this race last year. A 104° fever a few days before the race, gave me just about time to recover. I planned to stick to an aggressive 4:30min/km pace from the start, I was happy with the start. But a mild drizzle turned heavy, and by about 6km or so, my shoes were soaked. Water logging at the corners of the roads, didn’t allow me to cut them corners. I started to feel strain in my collarbones – I have noticed this happen in the past too, residual fever effect. After keeping a 4:30 & 4:35 pace for the first two 5k splits, I was unable to summon up reserves to keep it going. 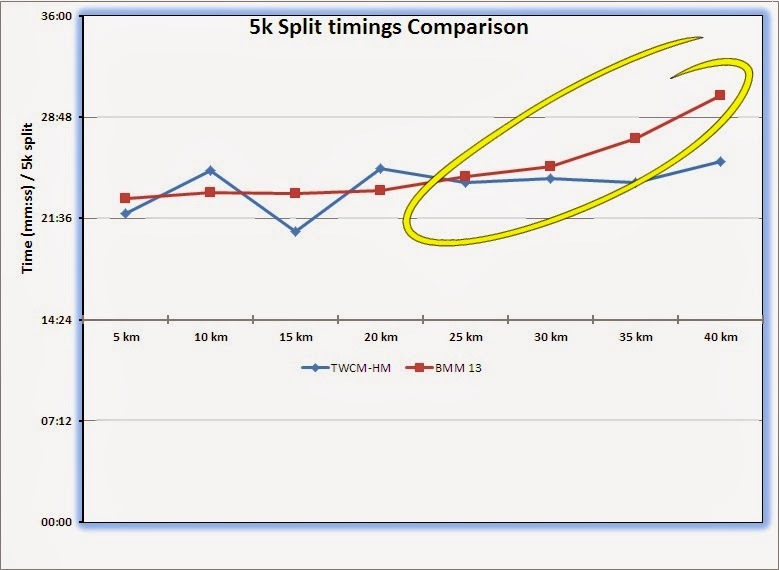 The last 2 laps were done in 4:52 & 4:58min/km average pace. 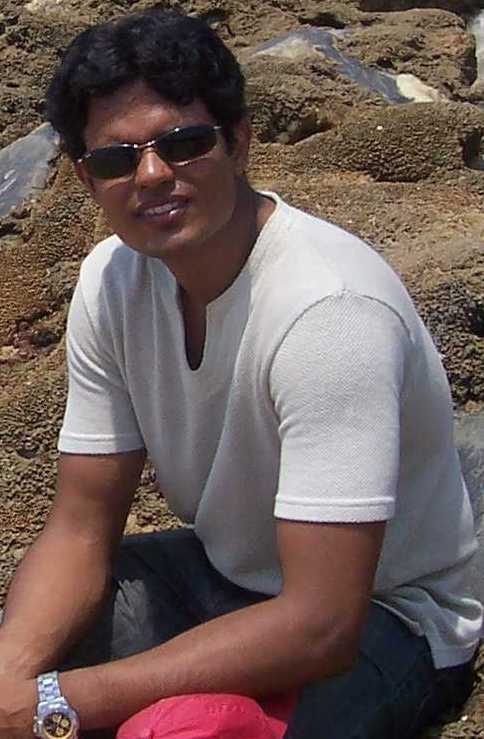 I caught up with Dharam as I finished, so we could both drown in our miseries together. I then paced a colleague, Ravi M, who was taking a shot at a sub-4 hour marathon finish and was very disappointed with what I saw of the marathon course. Last year, I raved about how awesome the course was and had convinced a few to include TWCM in their schedules. But this year, the course had changed for the worse. First, one had to run on the service road near Tidel park, both ways. It was swarming with casual bystanders, 5k, 10k, HM finishers, etc. None of this is good, especially since one had to do it from 26-29km and then again from 36-39km. Also, half marathoners who finished in around 2 hours had a nasty experience of running into the crowd of 10k runners, while on a narrow flyover! My finish was nicer, the medal was good, the post run snack box decent, the tee shirt very good, and a timing of 1:41:10, not bad. With about a week to go for the race, I received an email from the top brass at Dell to check if I would be interested in using a sponsor’s pass for the marathon. My weekly mileage was peaking and I decided to enter the race. Jack Daniel says “You should know exactly why you are running each race!” My plan was to go 15sec/km faster than my usual pace and hold this pace (4:45/km) for as long as I can. Although conditions would be very different from Mumbai, this was a good pace check op. I was setting myself up for disaster, and disaster did strike. The start point was close to office campus, despite the midnight start, there were no hassles in the pre-race routine. But a 15min delay at the starting line, in the cold night, made the warm up a vain effort. I had to run 10 loops to complete the marathon distance. There was no trouble till about the 4th loop, I had a banana and then an energy drink by then. Some doubts started to creep in by the 5th loop, but I had clocked a 1h:38m for half the distance. I was already slowing down by the time I hit the 7th loop and then drastically between 30-40kms. I took at least 10 walking breaks in this quarter, interlaced with some strong running. Although I gave up my pace targets, since this was already built into my race expectation at the start, it seemed ok to continue at a reduced pace. In the end, the average pace for those last two 5k were 5:27 and 6:04. There have been races while I have gone much slower after the mind had given up (see link). 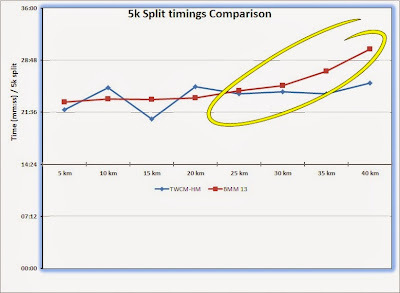 The 3:30 finish was on the cards, provided, the last 4-5k were done at close to 5min/k pace. The course was about 500m short and this helped sneak in just below that mark. I finished in 3h:29m:44s and was placed 9th in the men’s category, behind 4 Kenyan athletes, 3 from the army. It is important to make adjustments during the race, to ensure that the mental faculty is still with you during the final third of the race. Isn't it obvious where the focus should be?